The Catskill Geologist – Page 5 – "I will never kick a rock"
It was 2,300 years ago that Plato wrote of a great island, “larger than Libya and Asia taken together.” His island was the fabled Atlantis and it lay out in middle of the Atlantic Ocean, beyond the Straits of Gibraltar. The story went on: fully 9,000 years before Plato’s time, Atlantis was a great city state which controlled an empire extending as far east as Egypt and Italy. After fighting and losing a war with the Athenians, Atlantis was consumed by a day and a half of earthquakes and floods. The whole land mass sank into the ocean and it has been lost ever since. It’s a wonderful story and just the type that that we scientists love to debunk. But the word debunk implies ridicule, and when you ridicule a popular myth, you run the risk of appearing arrogant. Now, believe us, arrogance is not exactly unheard of in science, so let’s take a careful look at the story of Atlantis. We will find, as is so often the case, the true story is a lot better than the myth. 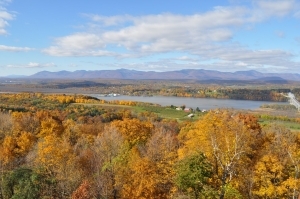 You can start by traveling to west of the Hudson River and gazing back eastward from any prominent high point, preferably the top of the Catskill Front. A lot of geologists have done this. They are looking at Columbia County and the profile of the Taconics, but nearly all have pondered the same question: Where did all this rock come from? Beneath them, the Catskill Front is made of 17,000 feet of sandstone shale and limestone. That’s only a small part of what is sometimes called the “Appalachian sequence.” The whole sequence consists of sedimentary rocks about 40,000 thousand feet or so thick. It wasn’t always rock, it was once all sediment. Sediment has to come from somewhere and 40,000 feet of it has to come from somewhere—and somewhere big, so you can appreciate the geological curiosity. In the 1840’s James Hall, the great Albany geologist, got very interested in finding where all those sediments had come from. He traced them all across North America and soon convinced himself that the thick Appalachian deposits always thinned to the west. 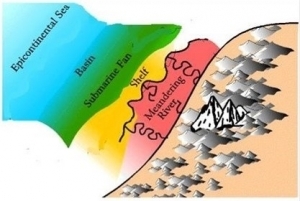 It must be, he thought, that if the sediments thinned to the west, then they must have come from a source in the east. Now James Hall had no interests in the myth of Atlantis, but other geologists wondered about that sourceland. Was this the real Atlantis? In the late 19th century, Charles Callaway calculated the total volume of sediment that made up the Appalachian sequence. From this he judged that there must have once been a sourceland out in the North Atlantic. He estimated it to be about the size of Australia. 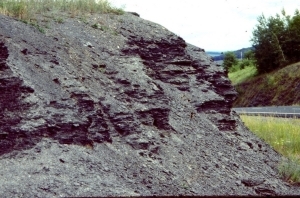 Callaway thought that the weathering and erosion of this sourceland provided the sediments of the Appalachian sequence and also similar rocks in Europe. Callaway thought that he had come up with the scientific discovery of an ancient lost continent–a real one! He called it “Old Atlantis.” Old indeed, Callaway’s continent was about 400 million years older than Plato’s one. 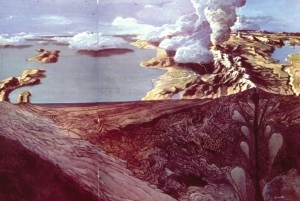 Callaway’s cross section of “old Atlantis” and its sedimentary rocks. Callaway’s idea remained popular into the 20th century, but as science progressed, it didn’t hold up all that well. Oceanographers were learning more and more about the floor of the North Atlantic. Surely, they reckoned, if there had once been and Atlantis out there, then some remnant would still remain, but none was ever found. The solution to the source land problem came in the late 1960’s and it was a terrific story, much greater than the old myth. Continents and oceans, it turned out, were not eternal. Once there had been no Atlantic Ocean at all, neither was there a North America or Europe. Instead there were great land masses, ancestral to the ones that we are familiar with today. Back then, an ancestral Europe was drifting westward and actively colliding with an earlier form of North America. As the two crushed together a great mountain range was thrust up all along the collision zone. Such things do happen and can even be seen today. India is colliding with Asia and the Himalayas are the product of that collision. Our Taconics and Berkshires are part of the 400 million year old ancestral Appalachian system. At their peak they were called the Acadian Mountains and they, not Atlantis, provided the sediments we see today in places like the Catskills. So the Atlantis of Plato’s myth never did exist. But when we debunk his story, it’s not arrogance, but confidence that science can provide a better story which motivates us. Our story tells of moving and colliding continents. The story speaks of once towering mountain ranges which are no more. It’s a great yarn and one of the most important scientific discoveries of the last century. And to us, the best is that the story comes from the stones. So find the time someday to take a hike up to the top of the Catskill Front and gaze east. Find the Taconics and Berkshires on the distant horizon. That’s Columbia County below them; it’s all “Atlantis!” Adds something to the view, doesn’t it? One of the great tourist attractions of our area is Olana, the one-time home of painter Frederic Church. We stood on the bank in front of the south-facing porch of the old mansion and gazed at its fine view of the Hudson Valley and Catskill Mountain. This is one of the great vantage points from which to see the Catskills. There are days when the atmospheric conditions are just right and the mountains seem to reach out to you. It’s not just a view; this is also a genuine work of art. Frederic Church intended the porch should have this vista; it is, among many others, one of his “planned views.” For thirty year he was able to enjoy the scene and we envy him that. But as geologists, we are privileged to see some other views at Olana. On that wonderful site our minds drifted back into deep time. We were at the bottom of the oceanic abyss that was once here. The waters were tens of thousands of feet deep, cold and black but, more than anything else, they were still and silent. This was a dead seafloor. Nothing crawled across the sea floor and nothing swam in the waters. We scooped up some of the mud; it was soft and sticky. It was foul with the remains of dead microbes that constantly rained in from above. With time the submarine avalanches came. Geologists call them turbidity currents. The stillness was abruptly interrupted as the sea floor was jolted by seismic shocks. An earthquake had struck. Shortly thereafter great masses of sediment began tumbling down the steep slopes. For long minutes there was the rush of dirty water into the abyss. The torrent boiled as murky clouds billowed upwards all around us. Then the current slowed and gradually the water cleared. The Olana sea floor returned to its silent dead, stillness. The passage of time accelerated. As we watched, this landmass grew taller and its shores swelled out toward us. We were soon lifted out of the sea by the rising gray crust. Occasional, the earth beneath us shook with powerful quakes as the land rose higher and higher. Eventually, we found our imaginary selves high atop a still rising Taconic Mountain range. To the north and south, volcanoes continued erupting in violent spasms. Below, to the west, what was left of that deep sea retreated away from the rising mountains. There should have been a great deal of green in this image but there was none. This was a fine range of mountains, but it was a dead landscape that had replaced a dead seafloor. 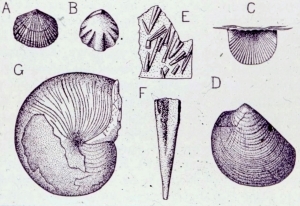 We were in the Late Ordovician time period, about 450 million years ago, and life, especially plants, had not yet managed to colonize the lands. All around us was a bleak, blue-gray landscape. There were not even proper soils, just a litter of gray gravel lying upon bare rocks. Only the dry channels of gullies and ravines broke the monotony of the desolation. We realized that we had come to the very spot where, 450 million year later Frederic Church would stand. But we were not seeing what he would see. No, below us and stretching off to the west, a large river delta had formed adjacent to the rising Taconic Mountains. A complex of murky streams crossed the dark gray of that delta. Farther away we could see the retreating waters of the sea. It was bleak and lifeless vista, but there was grandeur in this, Olana’s great unplanned. view. Once you begin to notice it, Cairo Round Top is a mountain you can see from all sorts of places within the Hudson Valley. It can be seen from the north and south and from above and below. It’s aptly named and rather picturesque for its smooth rounded profile, but the question that emerges is how did it get there. Any geologist, working in this region, would immediately guess that glaciers had something to do with it. And that’s exactly the case with Round Top. The proof comes with a careful look at its upper slopes. Most of Round Top is posted land, but there are several roads that circumnavigate the hill. On Heart’s Content Road, southwest of the hill, you can get a good look at Round Top. Up toward the top there is a great ledge of rock. 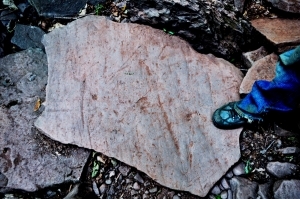 It’s typical Catskill sandstone. Long ago, nearly 400 million years long ago, that sandstone made up the channel of an ancient river. The quartz sands of that river have hardened into rock. Quartz sandstone is among nature’s hardest and most durable rocks. Hence the cliff, but there’s more than that. About 22 thousand years ago a very sizable glacier was advancing down the Hudson Valley. It filled the valley right up to the top of the Catskill Front. Indeed, it overflowed into the Catskills themselves. That, however, is another story. The important point here is that much of the time the ice overrode Round Top, the hill is only a little more than 1,400 feet tall and was not much of an obstacle to the flow of the ice. The glacier simply flowed across it. Glaciers have a very predictable effect upon mountains that dare to get in their way. They tend to streamline the upstream side of the hill. That accounts for the smoothly rounded form of most of Round Top. The other thing that a glacier does is a little more difficult to explain. The downstream side of the impeding hill comes to be sculpted into a steep downstream-facing slope, often a cliff. The process is called “plucking.” The ice apparently adheres to the rock and yanks loose large chunks of it and drags it off. Over time a cliff results, a scar of the plucking process. That is the explanation for that sizable ledge at the top of the south side of Round Top. Okay, so far, so good, it sounds like we have explained Round Top, but we haven’t. We understand the shape of Round Top but what is it doing there? Our curiosity is about why the mountain exists there at all. You see, the Hudson Valley glacier advanced down the valley at least from 25,000 to 14,000 years ago and that is a lot of time. It also passed down the Hudson Valley about 120,000 years ago during an event often called the Illinoisan glaciation. 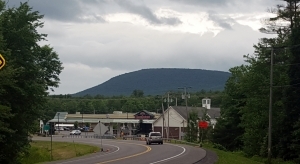 The passing ice plucked the Catskill Front as well as round Top and over time it sculpted the Wall of Manitou as the Catskill escarpment is sometimes called. And that is our problem. How come Round Top didn’t get scoured away entirely during all of this glaciation? We don’t know and that bothers us. We have been members of the Mountaintop Arboretum at Onteora Park in Tannersville pretty much since it was formed about 20 years ago. We have lost track of how many times we have made presentations there. But we are speaking at the Arboretum once again this Saturday, June 23, 2018 at 10:00 AM. We will be giving a PowerPoint presentation about the ice age and bedrock history of the Arboretum grounds. Then we will be taking our audience outside to do a geology walk across a good part of Arboretum property. It will be an easy walk across a relatively flat landscape. Try to come along, if you can fit it in to your schedule. You may not be able to attend so we thought we would put together a bit of a quick guide for some time when you will be able to get out there. 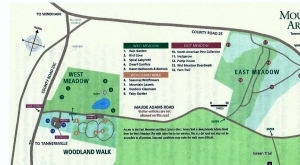 The main part of the Arboretum grounds are called the West Meadow and that is in the northwest corner of the property. Scattered across the West Meadow are the trees that make up the bulk of the Arboretum. You can visit and wander the trails that are there. You can look at the various species of trees which are all well labeled. There is even some art in the form of stone sculptures. But, of course, when we are there, we see the geology, a lot of geology. We will be speaking about it all on Saturday, but let’s focus on the West Meadow today. To get there you travel north on Rte. 23C north from Tannersville until you reach the Arboretum. You can park on Maude Adams Lane and then walk back to the gate to the West Meadow. When we are there, we look across the grounds. What we see is a landscape that shows the effects of glaciation. We see what might be called an ice-scoured plain. That is, we see a glacier sweeping down from the North and overrunning the grounds of the Arboretum. The most obvious manifestation of that is the exposed bedrock, right there at the gate. The bedrock, here, has been scoured by the passing ice. It has a smoothed and polished look to it. Wander around and look it over. You will, we think, be able to see the polish. Also, look for long straight scratches in the surface. They have a north to south compass orientation. These are glacial striations. If you have been a regular reader then you have seen these before. They were made as the glacier dragged cobbles and boulders across the surface. These are faint impressions and we couldn’t get a good photo, but you should be able to find them without much trouble. Next, watch for crescent shaped fractures in the rock surface. These are called chattermarks, they were formed when a boulder was dragged across this same surface. The weight of the ice pressed down, but the push of the glacier pushed it forward. When the push overcame the weight, the boulder “leaped” forward and “landed” leaving the crescent. Over time a series of crescents was formed. Next, look around and you will soon see a large boulder. That’s something called a glacial erratic. That’s a boulder that was swept up and carried along by the advancing glacier. 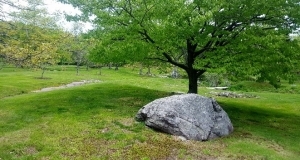 The boulder reached Arboretum grounds when the climate warmed and the glacier melted away. The boulder has been sitting here ever since the end of the Ice Age. Now you know enough to be able to wander the grounds of the West Meadow. We are sure you will enjoy seeing all the trees that are there. After all, that is why the Arboretum was established. But now you will be able to understand and appreciate that this is an ice scoured plain. Watch for other ice scoured outcroppings; there is a very good on in the southeast corner of the meadow. You will see other glacial erratics as sell; they are scattered about all across Arboretum property. We hope you will just plain understand this landscape better. 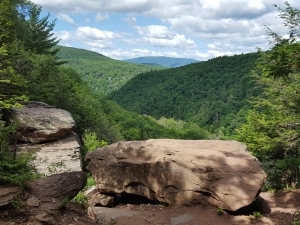 Kaaterskill Falls has always been renowned for its scenic beauty. It first became widely known after the nearby Catskill Mountain House Hotel opened in 1824. From the hotel the young landscape artist, Thomas Cole, went exploring and visited the falls. He painted two of his most well-loved views here, one from the top of the falls and another from the bottom. You will have no trouble finding these images online. The falls have, subsequently, been painted by generations of artists who followed in Cole’s footsteps. Generations of recreational hikers have also visited the falls and now the new staircase makes such visits much easier and far more practical. 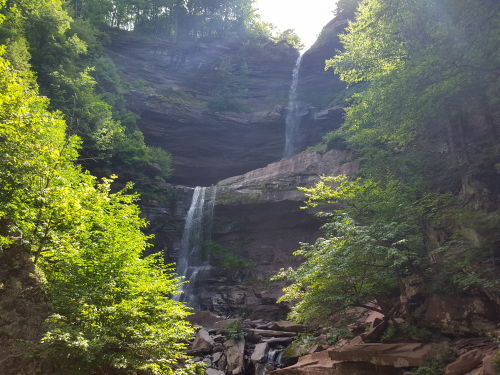 We have always admired the scenery at Kaaterskill Falls, but we are different from most others; when we visit the falls or look at those paintings, we see glaciers! We stand at the top of the falls and look down to see a glacier filling the valley below us; as we watch, it slowly rises up the canyon and then we have to step out of the way as it swells up over the falls themselves. We lift ourselves up into the air and turn around to watch as the flow of the ice continues on to South Lake. Geologists can do that sort of thing. How can we claim such otherworldly visions, especially as scientists? It is an extraordinary claim and Carl Sagan said it best when he said “Extraordinary claims require extraordinary evidence.” Can we back up our “visions” with evidence? Yes, we can. It all began down at Bastion Falls where we began our trek several columns ago. We had climbed down from Rte. 23A and were about to ascend the canyon. But, we looked around and noticed a number of boulders with remarkable features on their surfaces. Take a look at our first photo; see one of these boulders. 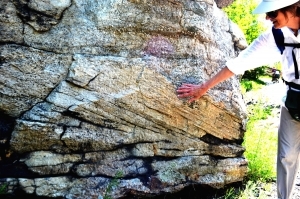 Notice that the surface of this rock is covered with large deep scratches. These are called glacial striations. This rock had been swept along with the flow of ice and dragged along for who knows how far. Along the way it was dragged up against many other similar rocks, and each impact left a scar in the form of a striation. After seeing the first of these down at Bastion Falls, our eyes were trained to notice more – many more. These comprised the “extraordinary” evidence of the glacier that had, long ago, flowed down the Hudson Valley, risen up Kaaterskill Clove and then turned into the falls canyon. We kept finding more of those striated boulders as we climbed up all the way to the bottom of the falls. We realized that we had been following in the path of the glacier that had been here perhaps 14,000 years ago. But, the question remained: had that glacier ascended up and actually crossed over the top of the Kaaterskill Falls themselves. Those falls are 260 feet tall; could a glacier have actually “climbed” over them? We needed more extraordinary evidence. We climbed the new stairs and hiked on to the top of the falls hoping to find that evidence. At the top of the new staircase a hiker is led to a dirt trail. That trail, in turn, leads to an intersection with the Blue Trail. A right turn there takes you on to the northern rim of Kaaterskill Clove; a left turn takes you to the top of the falls. We went left. Soon we were standing on the great ledge that makes up the top of the falls. We gazed down the canyon below and could not help but envision it filling with the ice of a glacier that slowly rose right up to where we were standing. But had that glacier actually passed this spot; had it risen and continued on to the north? We looked about and there was the evidence, something we had never noticed before at this spot. It had been very dry in recent weeks and the flow of water was very low. Most of the bedrock at the bottom of the stream was now exposed and on its surface we found the evidence we had been looking for. The sandstone came from a Devonian stream channel and it contained several small quartz cobbles. These had been carried by that long-ago flow of water. All these cobbles had originally been rounded by the Devonian streamflow. But now, each one had had its upper half planed off. 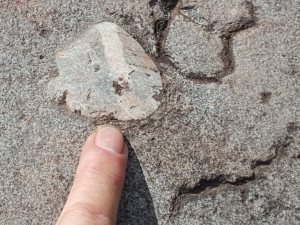 Its flat upper surface had been scraped flat so that it lay at exactly the same level as the surrounding sandstone (see our second photo). We were fortunate to have visited during a drought. Most of the time this ledge is very wet and very dangerous. These were ice age features that we have frequently seen elsewhere at North Lake. When a glacier moves across a sandstone landscape it is likely to intersect cobbles within the country rock. It will plane right through them. These are fairly common on the Blue Trail at South Mountain and near Sunset Rock, but this was the first time we had seen them at the top of Kaaterskill Falls. They are features unique to the flow of glacial ice; we had our undisputable (and extraordinary) evidence. Our glacier had risen up over the falls and scoured off the tops of those pebbles as it continued upstream. But there was more. At the top of Kaaterskill Falls lies a gigantic boulder (our third photo). Curiously, it does not have a name, but we immediately recognized it as being what is called a glacial erratic. Erratics are boulders that were swept up in the flow of ice and transported from where they came from and left where they are found today when the ice melted. This erratic had likely fallen off of South Mountain and onto and into our advancing glacier. It then flowed with the moving ice just to a site which would eventually be the top of the falls. Then the climate warmed, the ice melted and the erratic was lowered down to where it is seen today. It’s additional convincing evidence of the local glacier. Climbing up to the top of this boulder is not easy but it is worth the effort. We did so and found the name Sanford Robinson Gifford inscribed on its top. Gifford was one of the most esteemed members of the Hudson River School of Art. He had painted here and commemorated his visit with the inscription. We wondered if he knew the ice age origins of this boulder. One final treat for us was to walk down the dirt path that leads to the lands west of the falls. It only took us three minutes to get to the new deck with its knockout view of all of Kaaterskill Falls. We described that in the March 24th issue. Contact the authors at randjtitus@prodigy.net. Visit their facebook page “The Catskill Geologist.” Everybody else has. 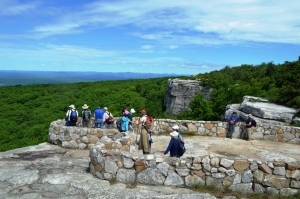 The Shawangunk Mountains are certainly among the most scenic locations in our region, and uniquely so. This ridge of resilient quartz sandstone towers above the Hudson Valley. One of its most popular locations is Sam’s Point Preserve, near the south end of the mountains. It’s thousands of acres are perched atop the mountains at elevations well above 2,000 feet. It’s owned by the Open Space Institute and managed by the Nature Conservancy. In the past there were commercial uses of this land. There were abundant blueberries here, and people were hired, every summer, to come and pick them. Then, in addition, there have been several resort hotels. But we came here to learn about the geology. How had the area’s geological history given rise to this scenic wonder? We headed up the trail. It didn’t take long to figure out why the Shawangunks are even there. All along the trail were massive outcrops of quartz sandstone and conglomerate. Quartz is very resistant to weathering and a mountain made out of such rocks will stand out as all other bedrock around it erodes away. We got up to Sam’s Point itself and soon learned much more about the geological history that went into creating the landscapes we see today. We arrived at the easternmost of two sandstone platforms, each seemingly designed for sight-seeing. Naturally, we were more interested in looking down at the rocks than gazing at the distant scenic views. There was some special things that caught our eyes. We saw a polished sheen and faint scratches on the surface of the rock. We quickly recognized these to be common ice age features. Sam’s Point has had a long ice age history, probably going back to the time when glaciers first came down the Hudson Valley. At that time this site had ice passing across it. The ice was dirty, carrying a great deal of sand along with it, mostly concentrated at its base. 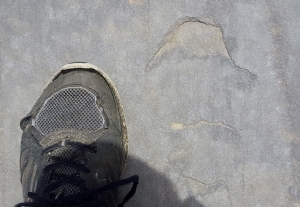 The sand, probably mixed with a lot of silt and clay, actually polished the bedrock. It sanded it down and planed it off. There was more. The glaciers carried with them a large number of cobbles and boulders. As these were dragged across the surface, they gouged scratches into the bedrock. Geologists call these glacial striations. We have seen such surfaces many times so it was hardly a great revelation, but it did speak clearly to us of the fact that there had once been a sizable glacier here. Then we saw more. We looked up and there was Sam’s Point itself. 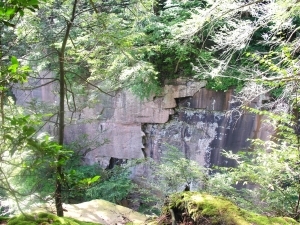 It is another natural platform of quartz sandstone, but this one is bounded by a vertical cliff, a big one. Most people would enjoy it as a fine scenic overlook, but our eyes took us back into the Ice Age. Geologists call features like Sam’s Point scour and pluck topographies. These are common and each is the product of the passage of the ice. The Hudson Valley glacier advanced from the north and, as it crossed Sam’s Point, it scoured and striated that platform at the top of the cliff. That’s the scour part. Then, as the ice continued south, it stuck to the bedrock and then yanked enormous masses of it loose and carried them off. That left gaping scars in the mountaintop and one of them is the cliff of Sam’s Point. That is also the pluck part of this landscape. The cliff faces a compass direction of south-30 degrees-west. That, presumably, was the direction the glacier was traveling. We looked at the striations beneath us, and we had a compass. They had the same orientations. Now we had a nice, coherent explanation for the topography of Sam’s Point. That’s what scientists call an elegant solution to a scientific problem. We would have been flushed with pride at having made such marvelous discoveries, were it not for the fact that thousands of other geologists had preceded us here, and they had, no doubt, all come to the very same conclusions. Certainly one of the most historic sites in all the Catskills is the Mountain House ledge at North/South Lake Campground. We are betting that most of you have been there. It’s a grand, broad shelf of sandstone, jutting out 2,000 feet above the floor of the Hudson Valley. It’s claimed that you can view some 70 miles of that valley from this site. 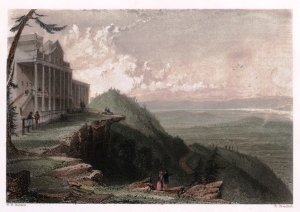 It is, of course, the very place chosen for the building of the Catskill Mountain House Hotel, back in the 1820’s. That was the grandest of the grand hotels of the Catskills during our region’s most fashionable era. The hotel attracted a Gilded Age aristocracy; a Who’s Who of the American elite vacationed there. But something spiritual happened here too. America came to love nature at this location. It was here that the Hudson Valley School of art was born, when Thomas Cole spent a summer sketching the scenery. Almost equally distinguished was the poetry and prose that was inspired by this “sublime” wilderness landscape. There is no way to overestimate the historical heritage of these few acres of land. The whole culture that we equate with the word Catskills had its birth at the Mountain House. And the hotel had its birth on this scenic ledge. It is one of our favorite places. We frequently go there and just sit upon the ledge’s rocks. We touch the sandstone and look around. All that lies above the ground, above those rocks, belongs to history. Here historians such as Roland Van Zandt and Alf Evers prevail. They explored the past at this site and recorded its many influences on our modern culture. But, we touch those rocks again. Everything below the ground belongs to us! All around is the historical heritage of modern Catskills culture but below is a geological past that reaches back hundreds of millions of years. Nearly four miles of sedimentary rock lies beneath us – right here. And, down there, every stratum of rock has its own history, from its own time. We touch this ledge and contemplate its petrified sand. It accumulated on the floor of a river channel. That was during the Devonian time period, about 380 million years ago. A river flowed by, right here, and then it disappeared off to the west. We gaze west and then turn around and look, more intently, eastward hoping to see where that stream and its sand came from. But . . . there’s nothing there but the great emptiness of the valley. Suddenly, we are time travelers; around us it is the Devonian time period. We are just above the waters in the middle of that stream, looking east. To our left and right are the river’s low banks. Rising above them are Devonian trees, at least they must be trees; they are so exotic, so strange in appearance. Frail looking trunks rise 25 feet above the banks. There are no branches, not until the very top is there even any foliage. All this defies all efforts at description. There are no leaves, just things that might be called fronds. But even that term does not suffice. These are among the most primitive “trees” known to science. They represent evolution’s earliest efforts at the very concept of a forest, and Devonian evolution has not yet become very good at that. If these trees defy description, it’s because nothing like them grows today. We turn and look east. In the distance a mighty mountain range towers above that horizon. We quickly realize that the Taconic and Berkshires of today are but the roots of this ancient mountain range. Their middle slopes are gun metal blue and cut by many enormous ravines. Above the blue is a horizontal white snow line. High above that are the white peaks of this enormous range. Our journey into the past is a brief one. Soon we sit again upon the Mountain House ledge and see our modern landscape. We have beheld its geological heritage. Our topic today will be one of the most notable paleontological discoveries ever made here in our region: the finding of the first mastodon. This was a big find and was made a long time ago: way back in 1705. That’s when a Dutch colonist found a huge tooth in a bank of clay along eastern bank of the Hudson in Greenport. It weighed almost five pounds and our Dutchman must have been most impressed. Not so impressed, however, that he was not willing to sell it for a half gill of rum (two ounces) to a local assemblyman. The tooth worked its way up the political food chain to Lord Cornbury, then Governor of the New York Colony. He sent it off to the Royal Society of London. Today, that would be like sending it to the Smithsonian Institute. The tooth attracted a lot of attention in London, and from just the right people. In 1705 not much was known about prehistoric monsters, in fact very little was known about prehistory. The scientists of the time were puzzled. There were two hypotheses. Some thought that the tooth belonged to a remarkable beast or fish, but they could not imagine what type of creature it had been. Lord Cornbury and others had another idea; the tooth belonged to a “giant” and they were talking of a biblical giant, referred to in Genesis 6:4. This tooth, they thought, had belonged to a huge human being! To his credit, Cornbury sent people to search the original site for more skeletal remains and they found parts of a very much decomposed skeleton. They estimated that the beast had been 70 feet long. In fact, they had greatly exaggerated its size, but you can imagine how they reacted to the very notion! From the beginning there were others who speculated that the remains belonged to an elephant, but what kind of an elephant and how did such an animal get to the Hudson Valley? For the second part of the question, here again, contemporary religious views offered a solution: the beast had been carried here by Noah’s Flood. That would be difficult to prove, but it was an appealing idea. It would take decades to solve the other half of the problem – what kind of elephant had it been – and that came when many more mastodon bones were found in the Ohio River valley, and a complete skeleton was unearthed in New York’s Orange County. Now, at last, scientists could see a whole skeleton with tusks, and clearly its bones were those of an elephant, or at least a distant cousin of today’s elephant. But only a distant cousin; now there was a new scientific problem. The mastodon did not match the Indian or the African elephants; it was a separate and new species. But nobody had ever seen such a creature in the wild. That was still another problem. At this time the very notion of extinction was a new and very troubling concept. 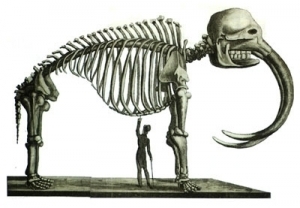 Could mastodons have once lived and then gone extinct? Not many people were comfortable with that thought. Theologians, especially, argued that no such thing could have happened; God would not allow extinction of species he had created. Perhaps but, if so, where were the living mastodons? That was a serious scientific question in the early 1800’s and President Thomas Jefferson, an accomplished amateur scientist in his own right, thought he could solve it. The Lewis and Clark expedition was soon to head west, and Jefferson specifically asked its members to be on the lookout for mastodons. Certainly the animals were extinct here in the east, but perhaps they still lived somewhere out there beyond the Appalachians. Well, Lewis and Clark found a lot of things all across America, but they never saw an elephant. The results were clear: mastodons were extinct and, like it or not, extinction was something that really could happen – and really had happened. All this adds up to some very important early progress in the science of paleontology. 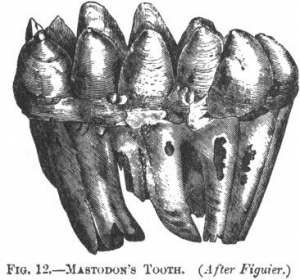 Our Greenport mastodon was among the very first prehistoric monsters to be discovered. Later generations would discover the dinosaurs, but these great mastodons are still quite something to contemplate. All this would lead, with time, to a great understanding of the exotic nature of our planet’s paleontological history; this was one of our first glimpses into life’s distant past. But, equally important was the introduction of the very concept of extinction. We take that for granted today but it was a most remarkable, and disturbing, discovery three centuries ago. Reach the authors at randjtitus@prodigy.net. Join their facebook page “The Catskill Geologist.” Watch for more articles in Kaatskill Life, the Woodstock times and the Mountain Eagle.